Here are my students’ finished stained glass panels. 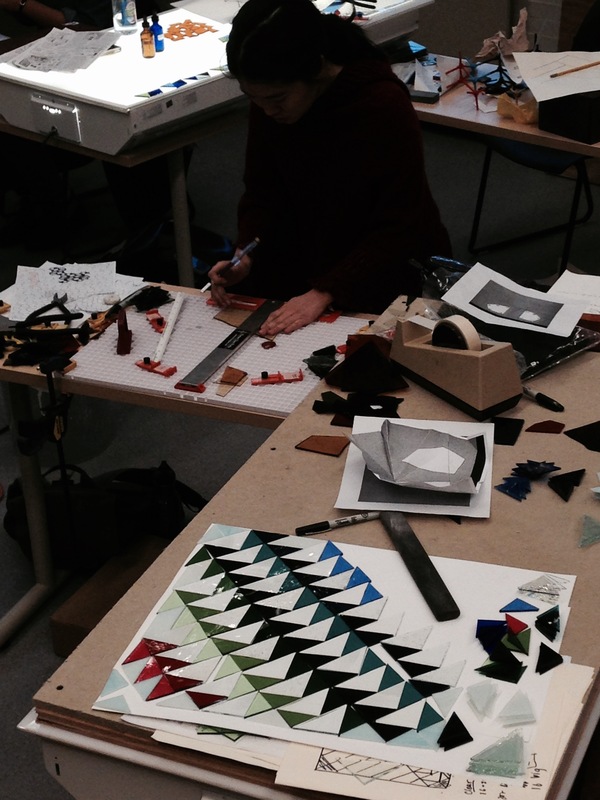 Photos taken by Ben Hoyle on the last day of Winter Study 2015 at Williams College in Massachusetts. 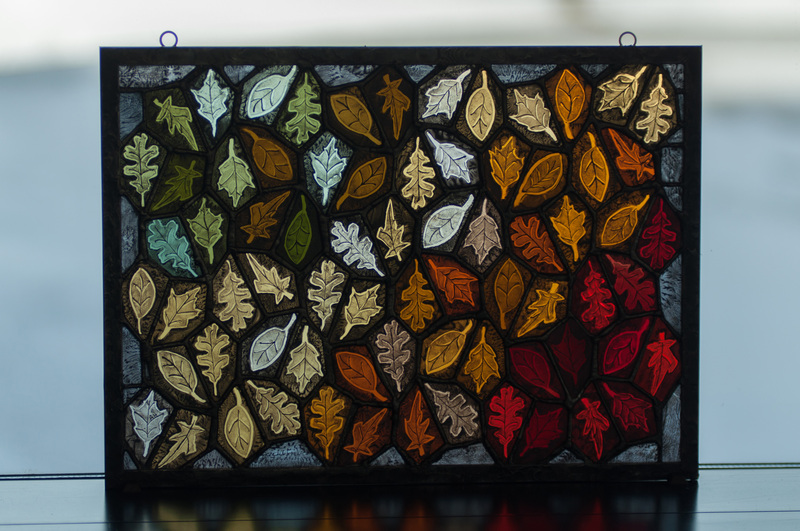 This piece was inspired by my love for the changing colors of autumn foliage. In my opinion, the fall is the prettiest time, especially in Williamstown. Walking around campus throughout the season has given me the opportunity to watch the leaves gradually transition from greens to shades of yellow, orange, and red. My piece attempts to capture both the imperfection and irregularities of nature’s creations while maintaining some sort of natural pattern and rhythm. I came into this winter study class with a lack of confidence in my artistic abilities and a perfectionistic mindset. However, throughout this class, I have learned to wrestle these challenges, which has been liberating. The idea of having to paint at least two different layers on glass terrified me. 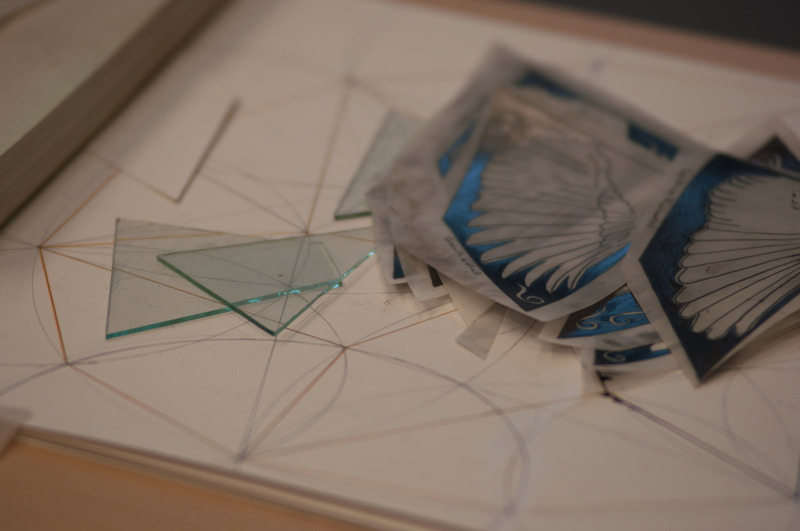 Thankfully, I have learned that there are so many simple ways to print and paint on glass that produces rather aesthetic results, but require very little actual skill. Furthermore, I have gradually shook my perfectionistic mindset by learning to accept “mistakes” as part of the process and embracing imperfections as a part of my artistic vision. This piece was loosely inspired by a quilt that used to hang in my grandparent’s dining room in Kansas. 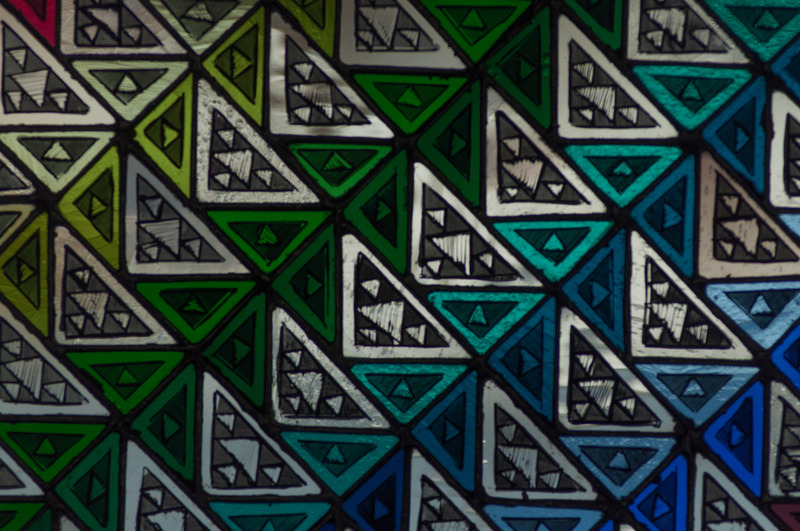 The color scheme and progression of the piece stemmed from that quilt, though the pattern is slightly different. 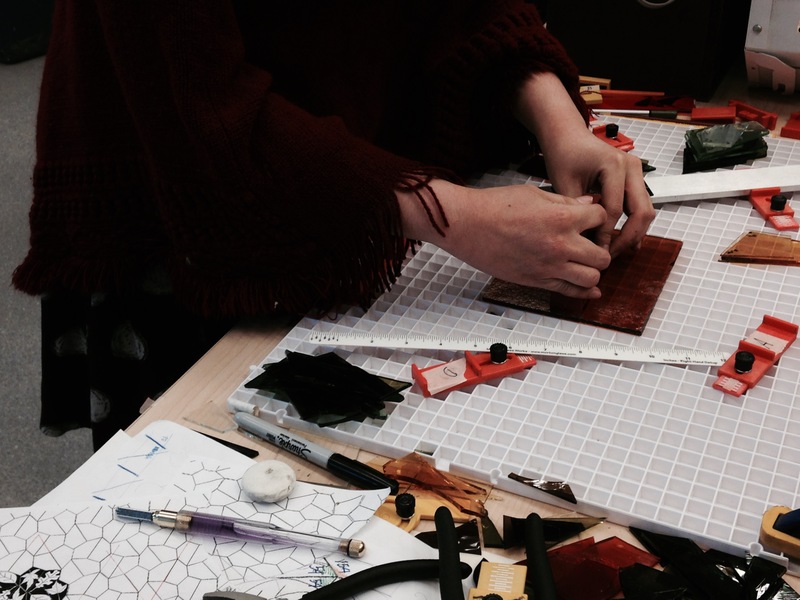 I took quiltmaking last Winter Study, and it was interesting to investigate the intersection of textile work and glass work. My final piece ended up looking much like a quilt, but stained glass tiling also incorporates painting, giving it another layer of texture that quilts get from their patterns. Ever since I was little, I have always loved being outside when the snow falls. I love looking up and watching the snowflakes appear out of the dark, separating from each other and become distinct, albeit fuzzy, entities, just before they alight on your face. 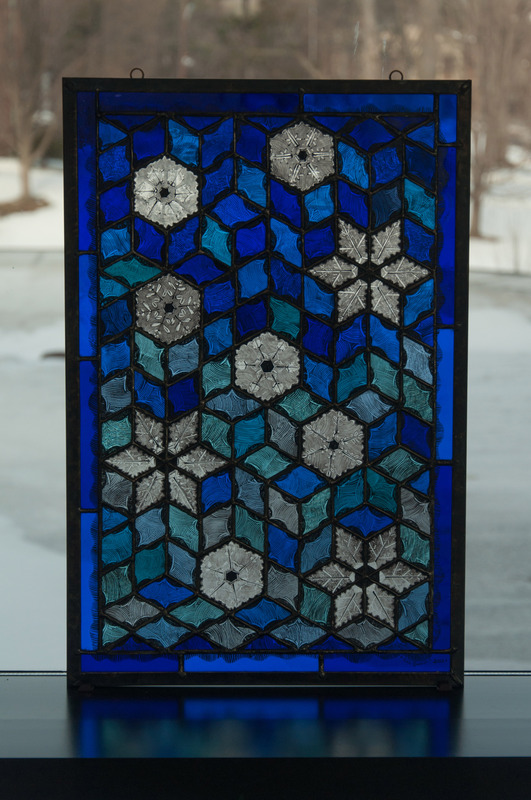 In my stained glass panel, I wanted to convey the motion of snow fall and also to focus on the snowflakes themselves, magnified in space against a blue sky background, in order to highlight what I love best about them: their intricate, unique patterns. This class has given me the opportunity to explore an art form that not many people have mastered, one that requires patience, trial-and-error, and the willingness to endure minor blood loss and burns. 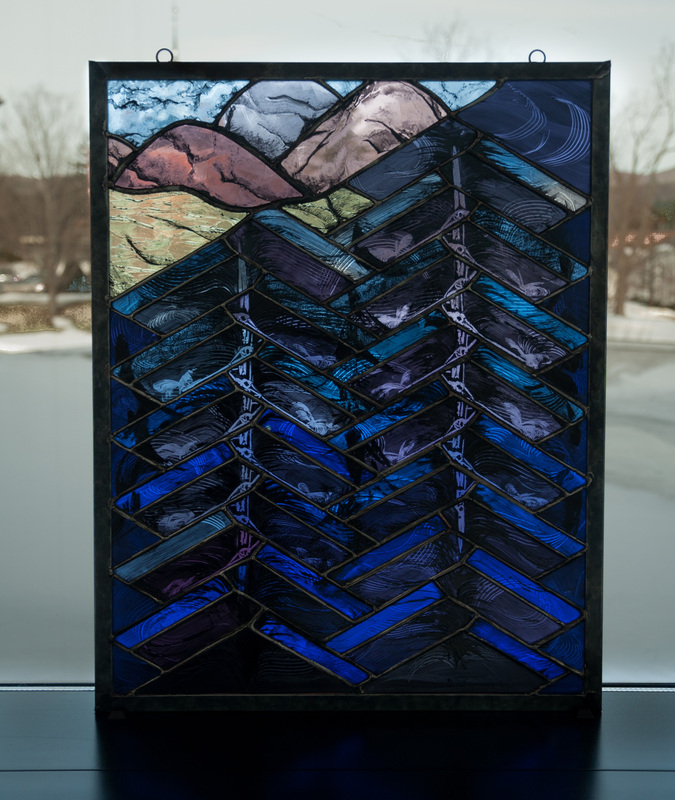 The end result is worth it, and each of the many steps required, from cutting the glass to painting to soldering the pieces together, felt like a mini victory. I looked at the panel in a new way each time I completed another step. The evolution of the piece took me by surprise in some ways, but if you allow yourself to just go for it and don’t overthink it, you end up with a different but ultimately more interesting work. Since childhood, I have made countless visits to my cultural homeland, China. The architecture and aesthetic of the Chinese people have, therefore, made a significant impact on the way approach my own designs. 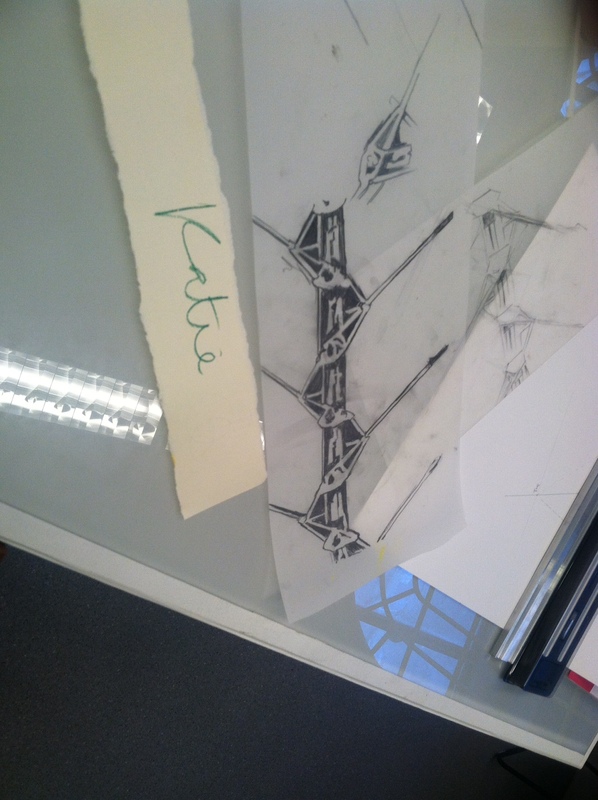 I gained inspiration for this design from a traditional, Chinese window frame. I have always been intrigued by the use of simple geometry in intricate configurations. Apart from the geometric stamp that represents the window frame design, I designed the bamboo tiles to weave and interlock, creating a departure from the frame concept. In this sense, my panel becomes a series of windows within a larger, all-encompassing window. The rubies and jades are also reminiscent of Traditional Chinese colors, while the subdued pink acts as a pleasant complement to the color scheme. Stained glass is a medium I thought I’d never work with, but it has turned out to be one of the most rewarding and fascinating. The process of creating this panel was both simple and complex at the same time, which is where the beauty of this art emerges. Many cultures utilize geometry in architecture, pottery, and other forms of art. 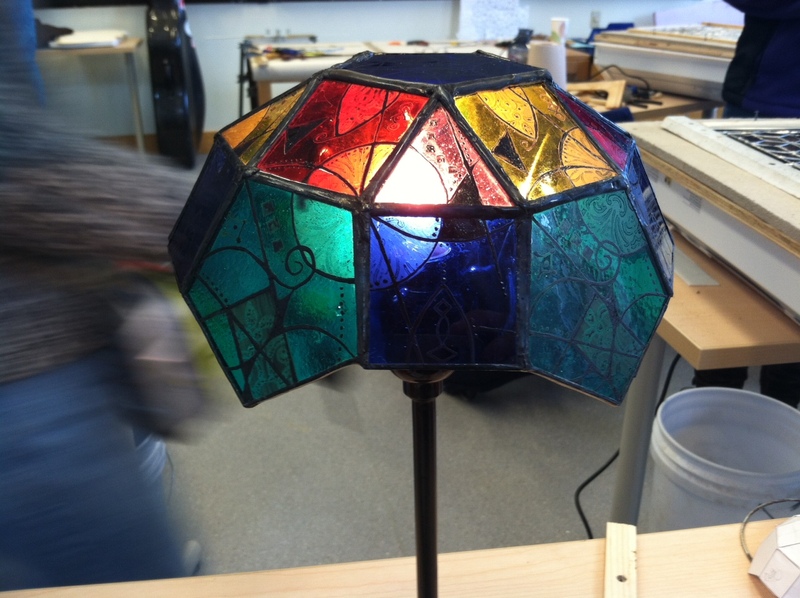 I used this fusion of geometry and aesthetics to drive the lamp’s design. 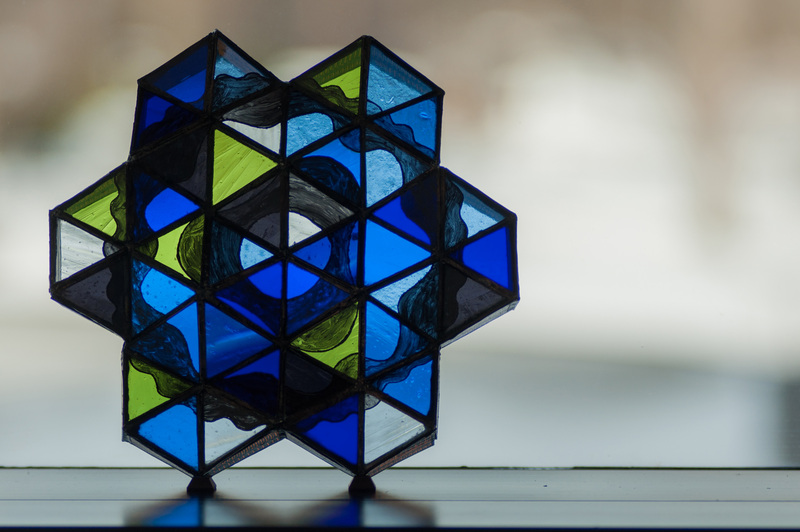 The lamp shape is based off the shape of an Archimedean solid, which is a symmetric polyhedron created by regular polygons. 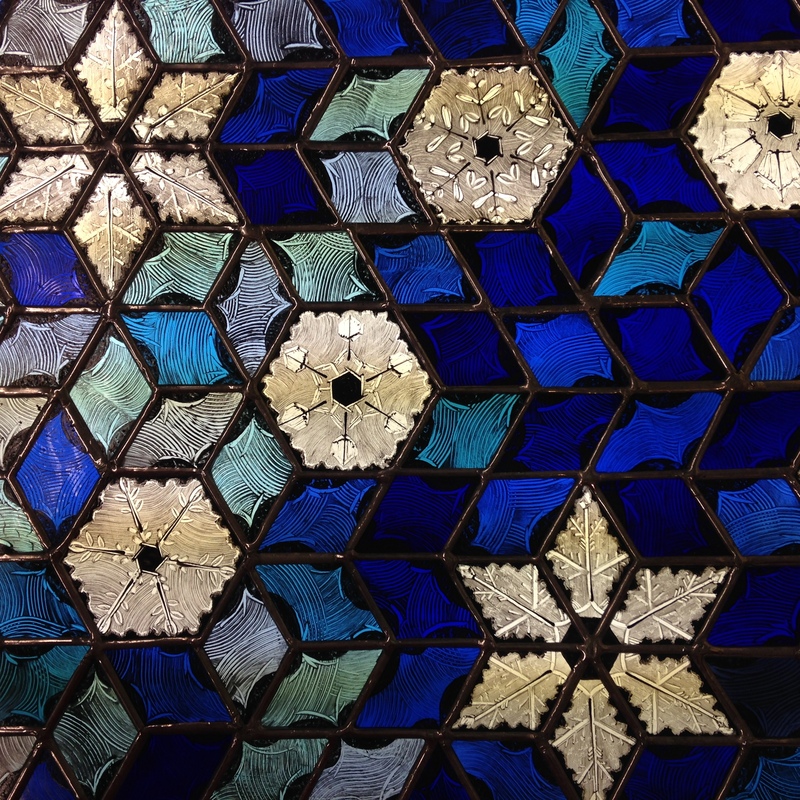 To create visual interest with the strict geometric shapes, I cut the polygons in vibrantly colored glass. The primary tracelines on the tiles are inspired by the lines and semicircles that are created when drawing a perfect regular pentagon with a ruler and compass. The additional designs are influenced by an Indian design called kolam, which creates shapes by doodling around a grid of dots, an example of geometry and aesthetic mixing in culture. These pieces required countless hours in the studio and a lot of dedication. We all wanted to create a piece we were proud of, and Debora’s encouragement and caring guidance kept us going through all the most frustrating steps. But a lot of our motivation also came from each other. We stayed for hours after class had ended because there were five other people staying to work with us. 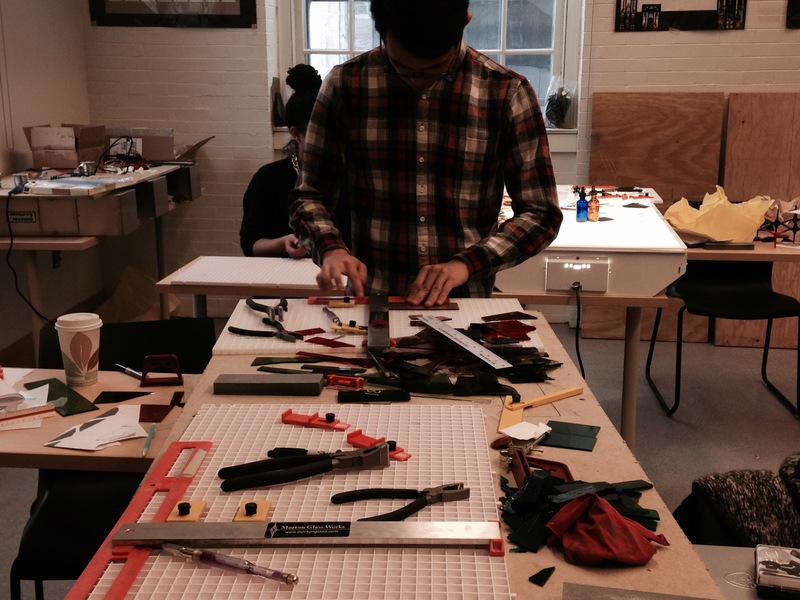 We perfected and polished our designs because we were inspired by the designs on everyone else’s table. Stained glass is a lot of work, but it isn’t difficult when there are nine of your peers working just as hard right next to you. 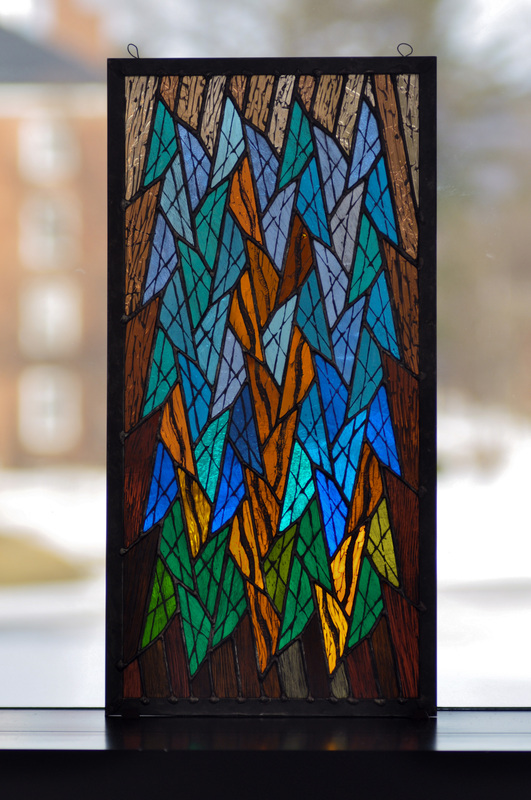 Since the beginning of this class, I was almost positive that birds would somehow play a role in my final stained glass piece. I have a great love of birds artistically, scientifically, and personally (I own racing pigeons!). Nearly all of my art includes birds, yet usually not in flight. I chose to create a piece centered on wings in order to explore this sense of flight that had previously been lacking from most of my artwork. I chose each wing with two requirements: the bird needed to represent a color and it needed to have only black in addition to that color. Most of the other decisions that I made for this piece were made as I arrived to them. Throughout this course, I discovered that choosing something without dwelling on it for too long and then sticking to it often created my favorite parts of the piece. 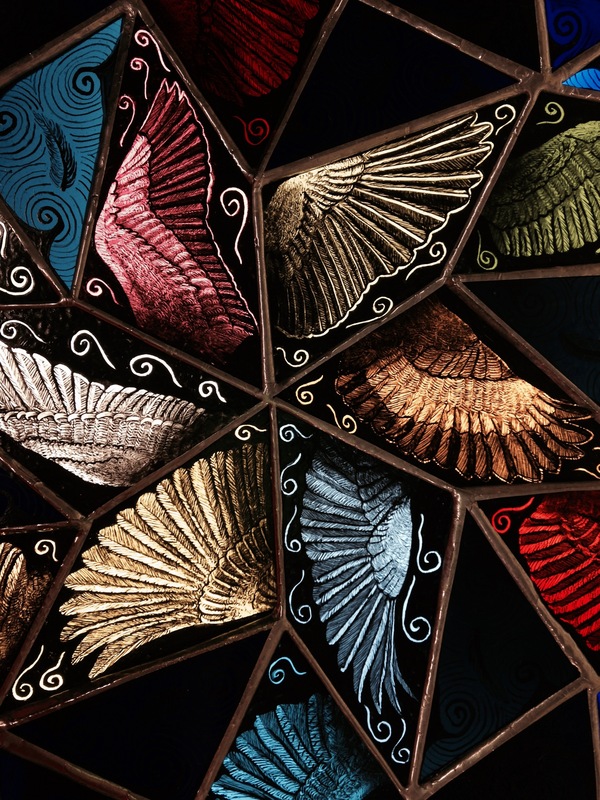 For example, after a few days of thinking that I wanted to incorporate wings into my piece, Debora gave me a deadline to choose a tiling pattern. I don’t think that I would have liked any other pattern more, had I taken longer to choose one. 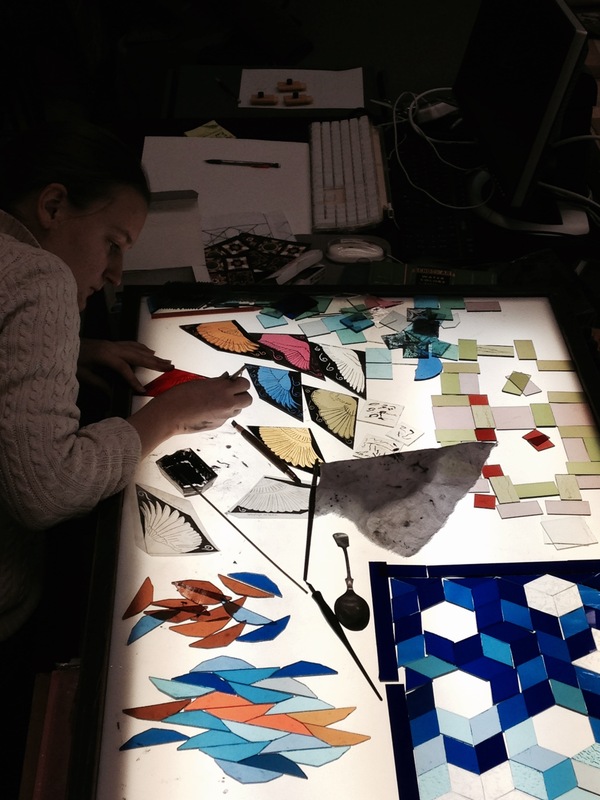 The entire process of stained glass tiling lends itself to this way of working. The paint rubs off the glass easily, making it very easy to start and restart painting a tile. 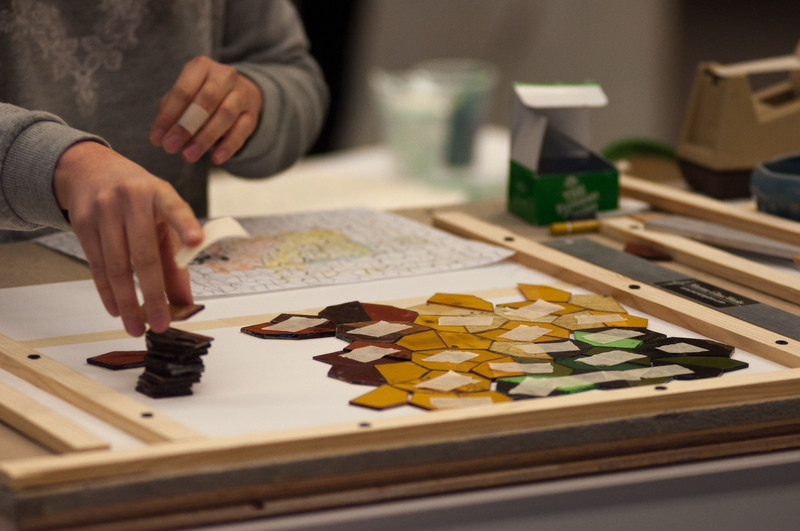 Once the tiles are fired, however, you cannot change the paint and therefore have to stick to and build off of your original ideas. When I had excess black around the wings, I rubbed away some paint to create swirls in order to make it more interesting and to let in more light. In the end, I used the swirls throughout my piece. These quick, yet deliberate choices let me bring the entire piece together and were the only way that I could have finished within a month. The main tile in this piece is monomorphic, meaning it can only tile in this one way. That’s unusual, and I also didn’t quite believe it, but now I do. I think if you look at the tiling by itself you can see a lot of different things and get overwhelmed. I decided to emphasize a few particular shapes, and overwhelm the viewer with lots of painting and colors instead. 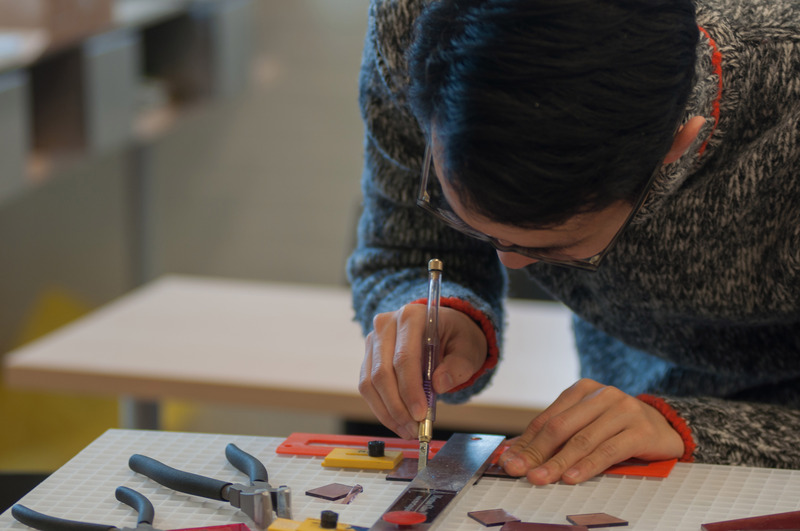 Repetitive tasks that leave slight room for variation are great, because you feel accomplished about making and learning things but also have half of your brain free throughout the whole process. The more crafts I do the more I think I should spend more of my time doing crafts. 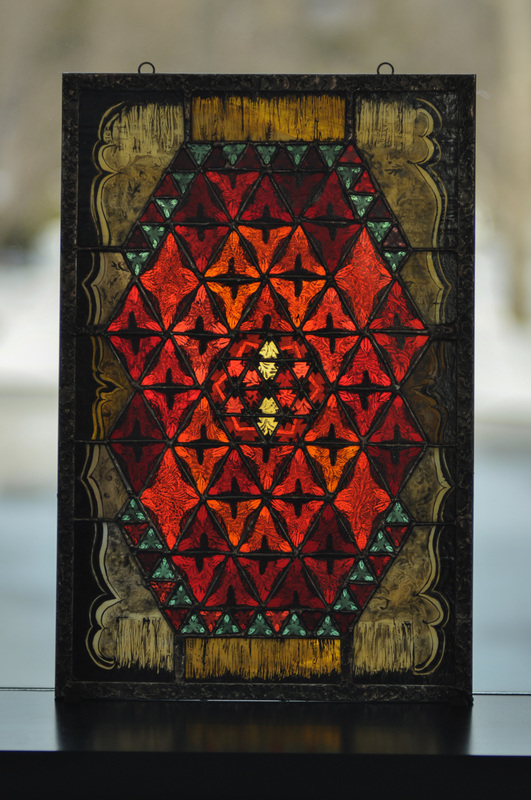 This window was inspired by the motifs and coloring found in Persian carpets. In my window I hoped to depict the same level of intricate patterning and warmth they contain. During this winter study I feel I developed an appreciation for the craft process. I have learned to enjoy the way a medium can influence a piece. I have particularly enjoyed the problem-solving thought process that goes into working around the obstacles inherited to a medium. I was inspired by the 6-membered carbon ring, which can act as a prototile. 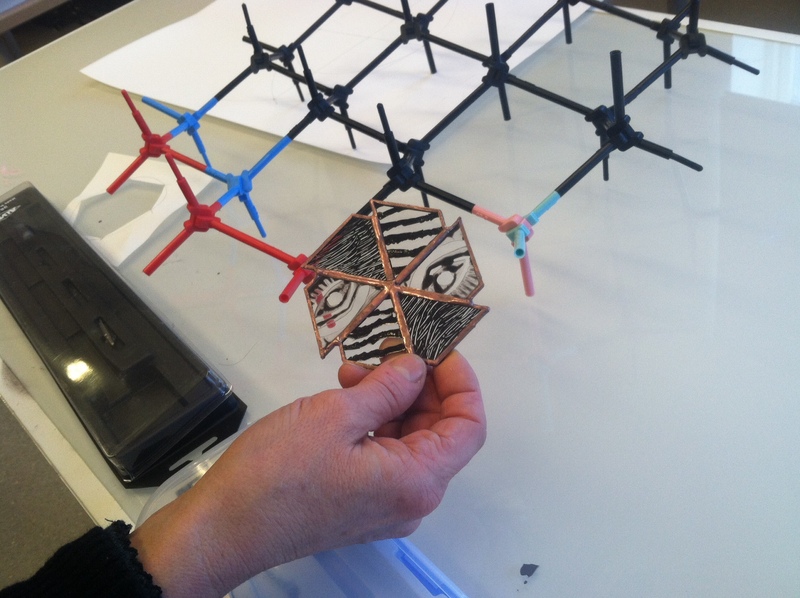 I knew I wanted to create something in 3D, and cyclohexane seemed perfect for that. I painted on the piece 3 separate rings that are made up of waves, like electrons in different energy levels. As for the color, I chose shades of blue and green, wanting them to blend with each other. During every Winter Study, I learned something that I would never learn during the regular semesters. I love working with my hands to build things, but I rarely get the chance to do so. It’s a great feeling to be able to design something in your head and be able to flesh it out, piece by piece. The idea for this piece came as I was examining my interests. Rowing occupies much of my time and many of my thoughts, and given its geometric and rhythmic nature, it soon become the focal point of my ideas. Every aspect of the sport seems to have a rhythmic nature – the physical hulls, the angles of the bodies in the boat, the patterns that the oars make in the water, not to mention the motion of the stroke itself. The aerial view of an eight seemed to capture most of these rhythms: the boat, the bodies, and the water. The interlocking herring bone tiling that I used seemed to capture the forward motion of the boats moving towards the top of the piece. I chose purple as the main tiling color for Williams Women’s Crew. This winter study has been a huge learning experience! One of the things that struck me early on in the course was both the interest in the material and the autonomy we achieved as a class. 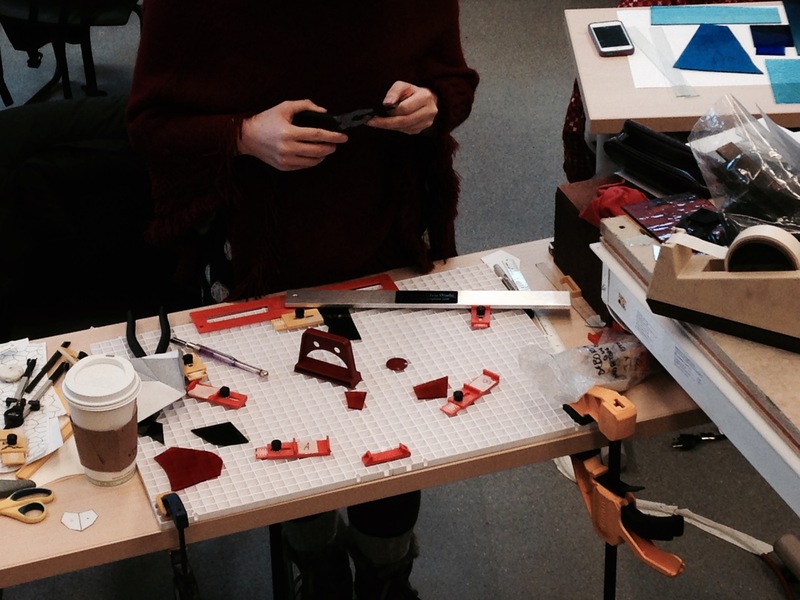 From the second week of class, students would go to our makeshift studio outside of class time (which was already scheduled as 13 hours/week) to work independently on projects. I was amazed then, and still am, at the enthusiasm that Debora inspired in us as a classroom, that at the beginning of the course had no experience or knowledge of the craft of stained glass, and because of this we had no grasp of the boundaries of what was possible; we envisioned what in reality turned out to be quite ambitious projects and Debora showed us how to create these ideas. 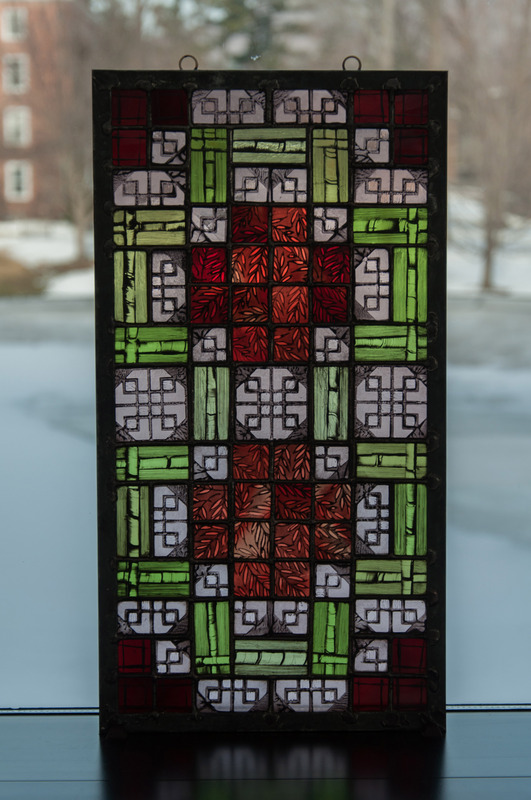 My Winter Study students will be showing their stained glass tilings at Williams College on Thursday January 29th, from 12 – 1pm. Everyone is welcome. The exhibition will be held in the 3rd floor corridor (overlooking the atrium cafe) between the Chemistry and Physics buildings. Enter the cafe from the Science Quad and look for signs. The best place to park is at the far end of the public lot across from Tunnel City Coffee. Ten students have created unique and personal works of art. 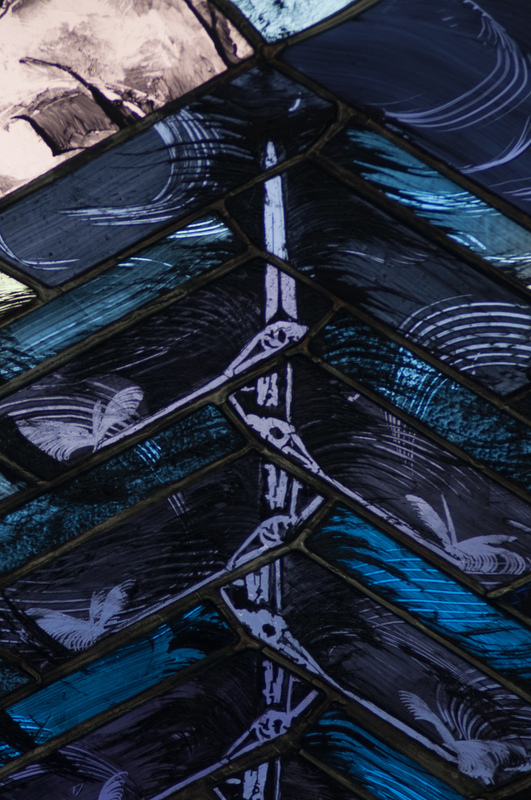 Here’s a taster: details of stained glass windows designed, cut, hand-painted, kiln-fired and assembled by Julia Damion and Ivy Ciaburri. 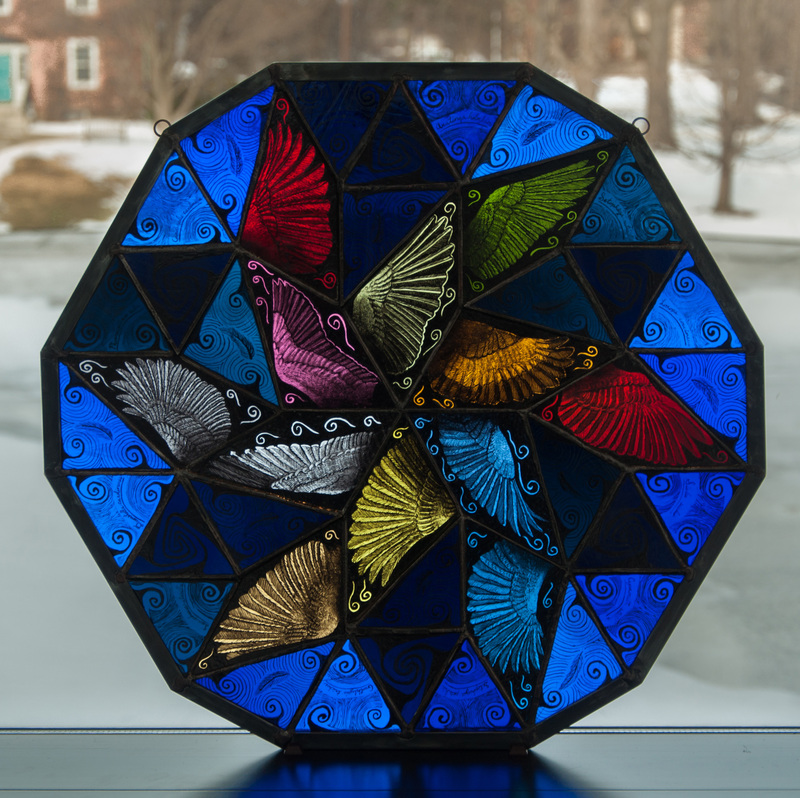 Ten wonderful Williams College students are building stained glass tilings with me during their month-long Winter Study course this month. Each student has designed a panel made from repeating geometric shapes cut in coloured glass using the Morton PG01B glasscutting system. 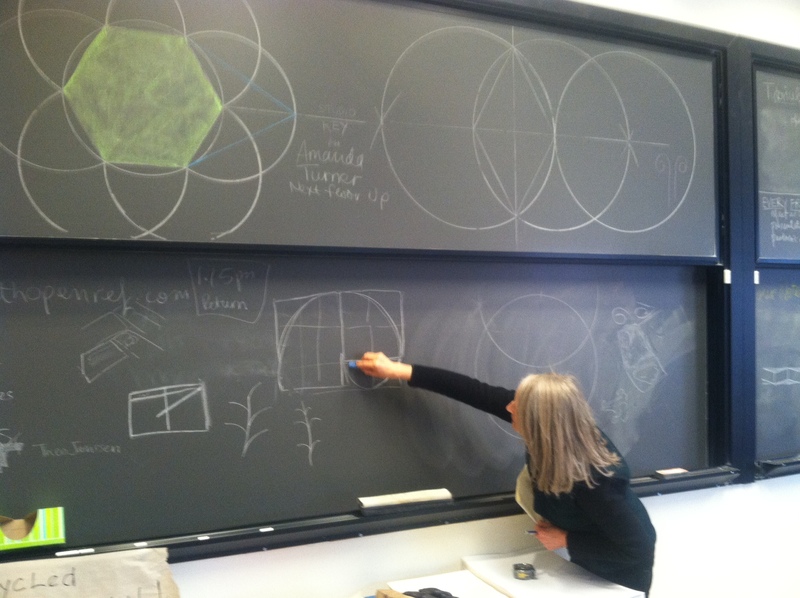 Some of the geometry is fairly straightforward, like a panel inspired by a grandmother’s quilt, and a regular polygon. 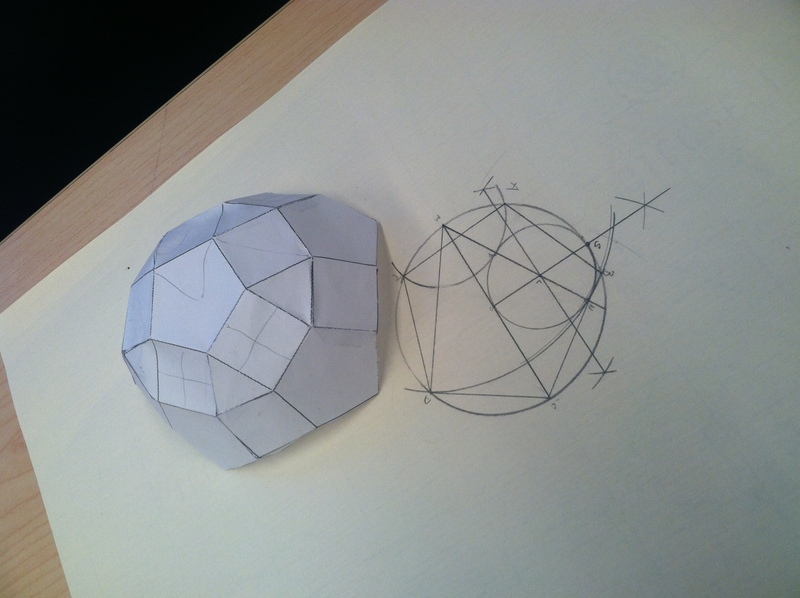 Others tilings were more difficult to draw with compass and straightedge, and complex to set up on the Morton system. One student is creating a 3D model of a particular type of carbon molecule. Every tile will eventually be painted and fired at least twice. 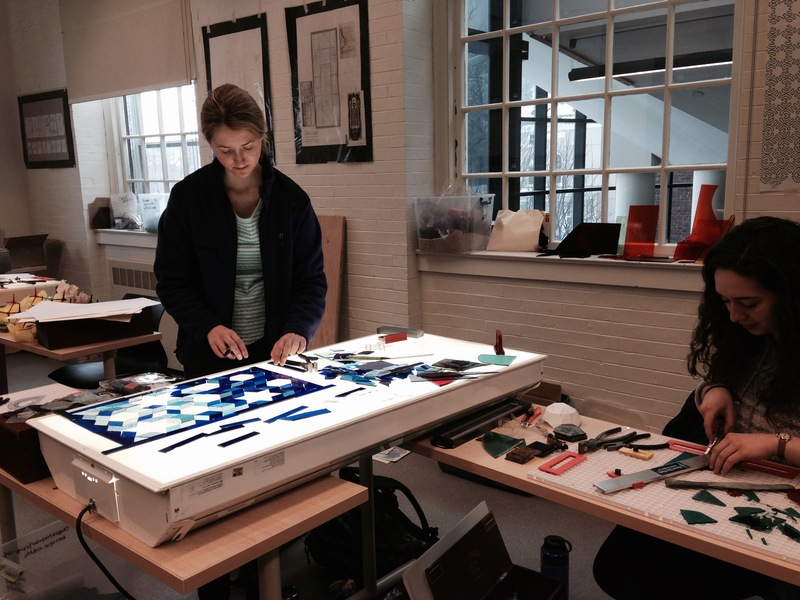 This last photo shows four different projects on the light table as students shuffle with colour layout and begin glasspainting. Thanks to student Ben Hoyle for the better quality photos above.